We’re all suckers for hyperbole and I don’t blame us. Who doesn’t want to see the best or witness something that hasn’t been done before? With the abundance of hyperbole that exists, especially in the sports world, great games immediately become the greatest games of all time and great players become the greatest to ever play the game. It is very hard to put games/performances into historical context right away. Therefore, it is easy to confuse the immediacy of a great performance that you just witnessed with all-time greatness. Having said that, I’m about to join the club and be very hyperbolic about one baseball player – 21-year old rookie Mike Trout. I am not the first person to be over-the-top about Trout’s talents and accomplishments thus far but all of the praise seems warranted. It feels like every day there is a new accomplishment that puts him in the company of Hall of Famers. He turned 21 years old yesterday and of course he homered on his birthday, joining Ted Williams, Frank Robinson, Alex Rodriguez and Jason Heyward as the only other players to hit a HR on their 21st birthday since 1939. The guy has literally done everything right since being recalled from Triple-A on April 28th. His numbers show it and watching him play confirms it. He’s lightning quick and could steal a base at any time. His speed also allows him to run down any ball in the outfield and his athleticism has given him a highlight reel of home-run saving catches that other players couldn’t put together in a career, let alone a rookie season. In 88 games this season, he is hitting .346 with 20 HR, 60 RBI and 87 runs scored. He has 36 stolen bases, a .409 on-base percentage and he is slugging .601 – good for a 1.009 OPS (on-base plus slugging). He leads the AL in AVG, R, SB and WAR (6.1), which measures the amount of wins the team earns with Trout playing over a replacement player. Now that the stats he compiled as a 20-year old are complete, he joins Ted Williams, Alex Rodriguez and Mel Ott as the only 20-year olds with an OPS over .1000 in baseball history. He is a serious candidate for MVP and a lock for rookie of the year. Oh and by the way, a midst all of these individual accomplishments, he’s a major producer on a team fighting for a playoff spot. Coming into this season, no one thought that the most talked about phenom would be Mike Trout but he has made people forget about Bryce Harper quickly. 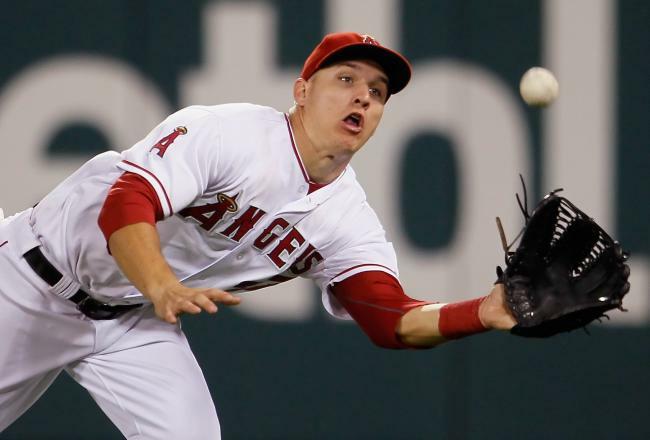 Whether your watching Trout play or looking at a stat sheet, it’s clear he is having a special season the likes of which hasn’t been seen in quite some time. You can make your own judgments and use a level of hyperbole you see fit. Now that I’ve said my piece, I am just going to enjoy the show.